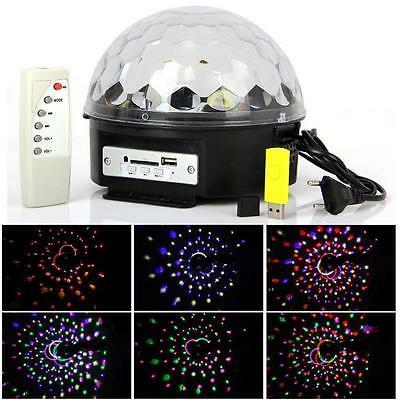 Exquisite appearance, streamline design, small size, light weight.High quality LED lights, power-saving, stable performance, high brightness, a long service life.Multiple channel modes and stroboscopic models, gradual, transition, water and other effects.Linking device via Bluetooth, 6 colors changes automatically, support MP3, USB/SD, remote control, easy to operate. 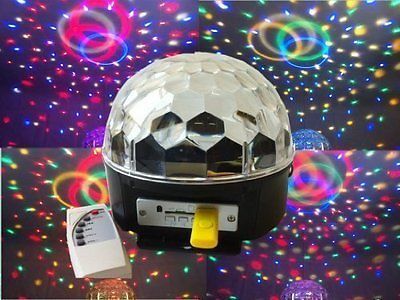 It is a new crystal magic ball, suitable for disco, bars, pubs, clubs, roller skating rinks, KTV, party, celebration, festival, store, park and other appointed place. Unique bluetooth connection cable, suitable for all bluetooth devices including smartphones like iPhone, Samsung, etc. It brings you endless music share. It is especially a good choice for you to create a live stage atmosphere and is an ideal private room lamp. Moreover, it can be powered by AC mode, portable which makes you enjoy fun anywhere. Lighting Mode: Voice-control, auto, MP3, Bluetooth. We ship from City of Industry, California 91745, only to eBay address. Package handling only takes one business day at our warehouse. Please make sure your shipping address and payment information before check out. Once payment is completed, Please contact us by phone or leave us a eBay note if changes are needed before we send out item. Our customer service phone number: 855.955.0066. If you have any changes, please inform us before 3:00pm at PST in the same day. *If address change is needed, you will be responsible for any fees associated in the condition that you contact us after we ship the item. *For international buyer: Import duties, taxes and charged are not included in the item price or shipping charges. Buyer will be responsible for these charges. And international shipping will usually takes 7 to 30 days, which depends on the customs. *Orders placed over weekend will be shipped within 2 days. Payment should be completed within four days of auction closing. Or unpaid dispute will be filed for closing auction. All of our items come with a 60-day return policy. We insure all our items are new and in excellent condition prior to shipping. In the event that you receive the item is not in the standards above, please contact us via eBay messages. All returns must be in new original condition as received and should be shipped with delivery confirmation. * Refunds given only if item DOA and cannot be replaced via PayPal. If so, please report it within 5 days of receiving the item and return to us within 30-days since the delivery date for exchange or refund. * If you need to return, please double check to make sure the item does not work and contact our customer service representative, let us know the detailed problem and send us some photos for confirmation. Then get a unique address to return. * All return requests MUST accompanied by an RMA(Return Merchandise Authorization) form be received within 60 days from the date of original order. * We only accept return for original package, please make sure the item has not been used or installed. * We reserve the right to refuse any return for any request that does not meet these requirements. If you have any problems/concerns of our merchandise/service, please contact us immediately and give us a second chance to correct it before you decide to leave any neutral or negative feedback. If you have any problems/concerns of our merchandise/service, please Click hereto contact us immediately and give us a second chance to correct it before you decide to leave any neutral or negative feedback. Saturday and Sunday are closed.